Woooooahh, it's the rematch! The National League Championship Series has the same opponents this year that it did last year. There is certainly lots of anticipation this year, after the Dodgers added a few phormer Phillies that weren't with the club last time around. Currently occupying roster space for the Dodgers are Randy Wolf, Vicente Padilla and Jim Thome. Eric Milton is also a Dodger, but has been on the disabled list since June. Add those players to the ex-Phils on the Los Angeles coaching staff, Larry Bowa and Mariano Duncan, and the Dodgers have quite a collection of guys with Philadelphia ties. Is Ed Wade secretly overseeing this team in addition to the Astros? Read on for details on the pitching match ups and additional information from this series. Thursday, 8:07pm. 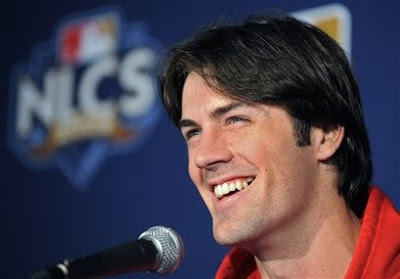 Cole Hamels (10-11, 4.32 ERA in regular season, 0-1, 7.20 ERA in post season) vs. Clayton Kershaw (8-8, 2.79 ERA in the regular season, 0-0, 2.70 ERA in post season). Hamels was 3-6 with a 4.99 ERA in 15 road games this season. Hamels is 2-0 in 4 career games against the Dodgers with a 1.50 ERA. Colbert in his last 3 starts is 0-3 with a 7.98 ERA. Matt Kemp is 7-for-17 (.412 avg) against Hamels in his career. Kershaw, the 21 year old, vs. the Phillies in 2009 was 0-2 with a 5.23 ERA. In his career against the Phillies, Kershaw is 0-3 with a 6.64 ERA in 4 games. At home this season, Kershaw was 3-4 with a 1.83 ERA in 16 games. Friday, 4:07pm. Pedro Martinez (5-1, 3.63 ERA in regular season) vs. Vicente Padilla (12-6, 4.46 ERA overall in the regular season). Martinez in his career at Dodger Stadium is 7-7 with a 2.93 ERA in 38 games (32 in relief). Pedro is 6-2 with a 3.40 ERA in 13 career postseason games. Padilla has only faced the Phillies once, and in that outing he allowed 7 earned runs in 6 innings pitched. Since joining the Dodgers in August, Padilla is undefeated with a 4-0 record and a 3.20 ERA in 8 games. In his career, Padilla is 1-2 with a 4.44 ERA in 8 games at Dodger Stadium. Raul Ibanez is 9-for-28 (.321 avg) with 2 homers against Padilla. Roster predictions made by me during my radio segment this week appear to be partially correct. I was correct in saying that Chan Ho Park would be added to the active roster for this series. I was wrong in stating that Eric Bruntlett would continue to be left off of the roster for the NLDS. Furthermore, they'll be taking the places of Kyle Kendrick and Brett Myers (both guys I suggested could be replaced by Park). Only 11 pitchers on the roster this round. Ryan Howard against lefties Clayton Kershaw, Randy Wolf & Hong-Chih Kuo is a combined 2-for-20 (.100 avg), in his career. Howard's OPS was 435 points lower against lefties than it was against right handers this season. Carlos Ruiz hit .571 with 3 doubles and 1 homer in 7 games against the Dodgers this year. Ruiz has a .279 batting avg. in 21 career post season games. Chooch's 4 hits in this year's NLDS matched his total from the previous 2 seasons in the NLDS. Dodgers rookie reliever Ronald Belisario had a 1.21 ERA after the all star break. Belisario allowed 16 earned runs all season...the Phillies scored 2 of those runs in just 3 innings against him. In 24 games against the Phillies, James Loney is a .362 hitter with a .934 OPS. Loney is a .348 hitter in 12 career playoff games. Manny Ramirez, from September 1st till the end of the season batted just .218. His batting average this season was 57 points lower at home than it was on the road. For updated stats, alerts, insight and trivia- follow PhoulBallz.com on Twitter HERE!